Influenza affects thousands of adults every year. Symptoms of influenza can cause a lot of discomforts and sometimes can manifest into serious conditions. 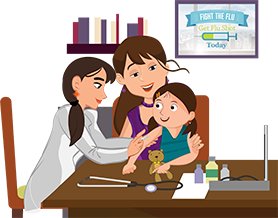 The flu can be easily prevented with the help of an influenza vaccine. We, at Apollo Clinic, are committed to providing quality healthcare services prevention of serious conditions including influenza vaccination for adults. Popularly known as the flu, influenza is a viral respiratory disease that spreads very easily. The flu could lead to serious health complications and sometimes even death. Influenza tends to be more widespread during winter, but it could infect you anytime during the year. The flu is generally caused by influenza viruses A and B. However, there are different strains of flu virus each year. Children and adults share most symptoms such as a runny or stuffy nose, general fatigue, headache, body aches and a dry or a sore throat. Flu symptoms in adults can be severe. In many adults, a sudden fever is often the first symptom of a flu infection. If you break into an abrupt high temperature greater than 100°F, it could indicate a flu infection. Influenza symptoms in adults also vary from individual to individual. What is an Influenza Vaccine and How Does It Help? Though flu sounds like a minor condition, it could be the cause of serious health conditions in some people. The best way to protect yourself is to get an influenza vaccination, also known as a flu shot. Strains of the flu virus are injected into your body and your body starts producing antibodies against those virus strains. If you come in contact with the flu virus later, you are protected from the virus. Even if you come in contact with a different strain of virus, the vaccine will help and your symptoms will be less severe. Who Should Get the Influenza Vaccination and When? Whether you are young or old, healthy or frail, the flu infection can affect you. At Apollo Clinic, our doctors strongly recommend that every adult gets a flu shot every year. The ideal time to get an influenza vaccination is a couple of weeks before the winter season. This gives enough time for the antibodies to develop and fight the infection. It is especially important for adults over the age of 65, pregnant women, adults with diseases of the lungs, blood, heart, liver, kidneys or metabolism to get a flu shot. The influenza vaccine could cause slight side effects such as a sore throat, mild fever, runny nose, headache, feeling tired or achy. There may be some swelling, soreness, or redness around the injection site. If you experience trouble breathing, feel weak or dizzy, have a fast heartbeat or hives, rush to a doctor immediately. There are numerous influenza treatments available such as decongestants, pain relievers, cough suppressants and expectorants. Before starting any influenza treatment, do consult an expert doctor as incorrect treatments could sometimes prove to be deadly. At Apollo Clinic, we firmly believe that prevention is better than cure. Our dedicated team of doctors and support staff takes every measure possible to ensure that you are in the pink of health always. To this end, we provide influenza vaccination for adults so that you can be protected from flu infection.